Three of these DIY CNC Stepper Motor assemblies are required. The parts list is only for one. 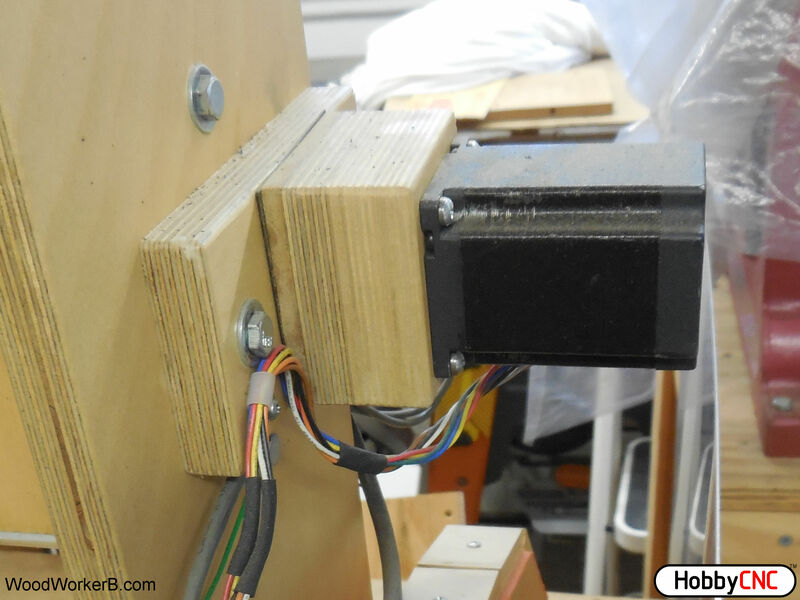 The stepper motor needs to be spaced away from the axis to accommodate the coupling spider. You could go with a solid coupler if you are 100% sure you have zero misalignment between the lead screw and the motor shaft. The bottom of the spacer block is open to provide visibility and facilitate alignment of the coupler when installing the stepper. Also, the heads of the 4 machine screws may be too large in diameter to fit the flange of the stepper. I had to chuck them in my drill press and reduce the diameter using a file. You could likely use a hex socket-head machine screw instead, and skip the hand crafting. 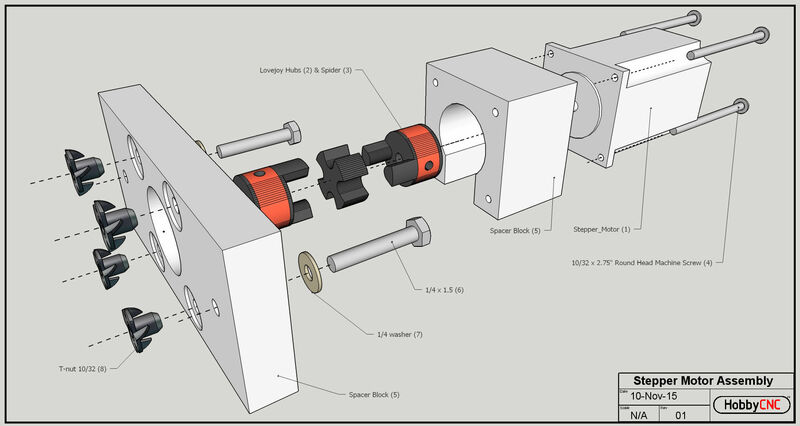 The Spacer Block (5) serves two purposes: 1) it allows easy adaption to different stepper motors without having to re-design the individual axis parts, and 2) it moves the mounting points away from other, interfering ‘stuff’. Here’s a photo of an completed Stepper Motor Assembly. I also added a small wood screw and a cable clamp as a strain relief for the wiring to the motor. This assembly mounts to the mill with the two 1/4-20 bolts (4). The thickness of the Spacer Block (5) is adjusted as necessary to adapt for the coupler length, stepper shaft length and any “double nuts” at the end of the threaded rod. Parts list is for quantity of one. Three of these DIY CNC Stepper Motor assemblies are required. Low cost, high quality, high power Stepper Motor Driver board kits, perfect for the DIY Mill, DIY Router, DIY Wood Router or DIY mill.